Tox-Nil with acids - Aniruddha Enterprises Pvt. Ltd.
Acids have many roles to play in animal nutrition. Since the advent of ban on antibiotic growth promoters, acids or acidifiers have gained rapid popularity in managing gut flora and resultantly minimizing risk of disease. Organic Acid salts also exhibit strong anti-mold properties. Tox-Nil* with acids consists of a blend of select potent organic acids which thwart mold germination & growth. Organic acids drop the pH in feed. Resulting acidification creates a lethal environment for many micro-organisms & molds. Organic acids, in Tox-Nil* with acids prevent bacterial & fungal growth in stored feed. Organic acids & HSCAS in Tox-Nil* with acids act in synergy to prevent mold formation and adsorb mycotoxins without causing damage to the birds. Tox-Nil* with acids acts as an aflatoxin enterosorbent that tightly and selectively binds mycotoxins in the gastrointestinal tract of animals, decreasing their bioavailability and associated toxicities. Tox-Nil* with acids is inert & safe for birds of all ages. 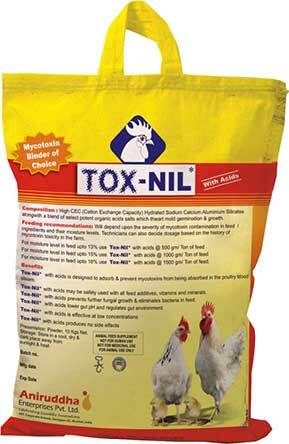 Tox-Nil* with acids may be safely used with all feed additives, vitamin & mineral premixes. Tox-Nil* with acids secures significant improvement in body weight, Reduction in F.C.R. & Decline in mortality rate.